Julie Balagny is a little bit of a mystery, a bit of a recluse and a true artisan who cares for little except her vineyards and making the kind of wine she loves. We spent a long time looking for Julie and once we found her through the help of some friends, we had to spend plenty of time convincing her to send a little wine to London. We are happy she agreed, because her wines display everything we love about great Beaujolais. Originally from Paris, Julie spent years making wine for others in the southwest of France before deciding to branch out on her own and when the time came in 2009, she wound up in Beaujolais. She found a remote eight hectare property in Fleurie, encompassing three hectares of vines on some seriously steep slopes, surrounded by prairies and woodland. In a normal year Julie will bottle three different wines from this plot; Cayenne, En Remont and Simone, reflecting three vastly different terroirs. Vines are between 30-90 years old, vineyard work is organic and because of just how steep those hills are, done by hand. 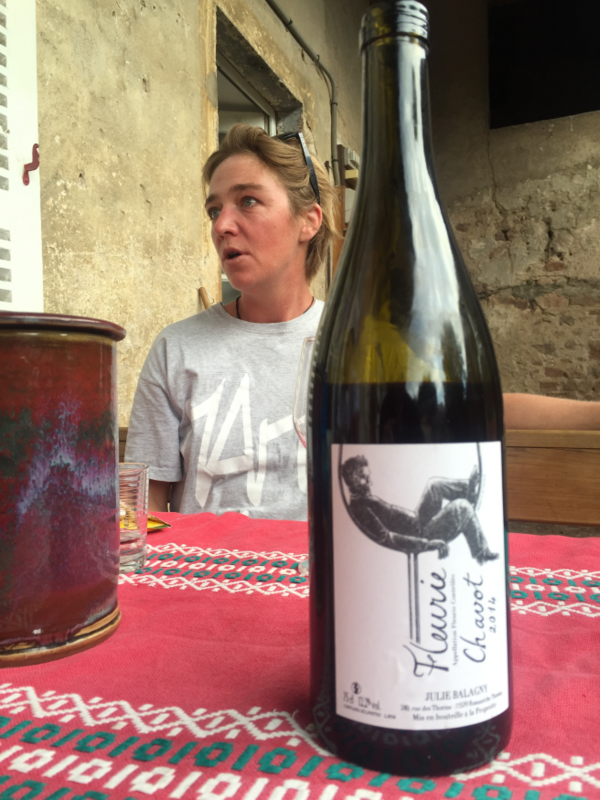 She recently acquired a hectare of Beaujolais-Villages and little under a hectare of Moulin-a-Vent and now works a t0tal of just under five hectares of vines. In the cellar, Julie works in a similar way to most of the area’s greats. Whole bunches enter the vats, ferment naturally and undergo a cold carbonic maceration. Once there, the fruit is left to be, there is no remontage, no pigeage. Once the maceration is finished, the grapes are pressed slowly and gently over the course of several hours, by hand, using a very old press. Elevage is in old barrels and when ready the wines are bottled unfilftered, with no additions at all. Like all great wines, there is something about Julie’s not easy to t0 put into words. They are bound by gorgeous aromatics, real detail and a feel-good quality that we just love. We are very happy to finally be working with Julie and to have a little of the following wines. The fruit for her Simone comes from vines up to 90 years old planted on steep hills over quartz in a remote part of Fleurie. Simone was troublesome to say the least in 2o14, a little volatile, the fermentation never quite finished until the following year. She has cleaned herself off a little and now we are left with a spritely, delicious little wine. Also available in magnum. A new vineyard for Julie, from about a hectare of 65 year old vines planted over white sands near Fleurie. Dark, yet lifted, structured and spiced, this is an incredibly appetising wine that is just so spot on with autumn’s larder. From a tiny plot planted on a particularly steep slope rich in quartz, with vines over a hundred years old. This is wonderfully concentrated and deep, with a seriously exotic nose giving way to a palate that is just pure silk. A complex, incredibly delicious wine.